Posted January 30, 2019 by Mitch Hitch & filed under Bondi View, Featured Bondi View. 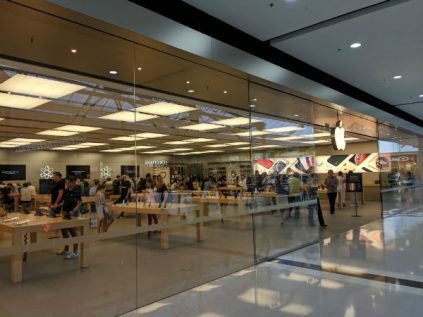 Tech giant Apple has left a sour taste in a customer’s mouth when staff at the Bondi Junction store withheld an iPhone belonging to a twelve-year-old girl after she left it at the store to be repaired on 29 December. The screen of the phone was cracked. When she returned on 31 December to pick up her phone, the minor was offered a new replacement phone. She did not know how to transfer data from her old iPhone to the new one. so she refused the offer and asked for her old phone back, only to be denied this by staff. She left and returned with her father, practising lawyer Alex Tees, who managed to retrieve his daughter’s phone from the Apple staff. Mr Tees described his daughter’s ordeal as “unreasonable” and said the nature of the terms and conditions of repair, and Apple’s behaviour towards his daughter, was “completely unconscionable”. “Their, what I’m assuming is a, background contract falls completely outside of legislation if this is what’s allowed to happen, especially when dad’s paying extra to insure a phone that technically isn’t his,” he said. “She is a minor and as such she cannot be held to a contract. If they say it’s ‘their phone’ in the terms and conditions, then that’s simply not on. City Hub attempted to talk to an Apple representative, and while they weren’t able to provide a response, they referred us to Apple’s repair terms and conditions. This City Hub writer is confused… could Apple have not backed up and transferred the data during their “repair” process? Mr Tees notes that Apple’s staff behaviour undermines contractual obligations and inspires customer distrust for the company. Mr Tees suggested that a local phone kiosk may offer a customer more satisfaction in telecommunications. “There is a systemic fault with Apple iPhones. From generation whatever they’ve gone up to, they’ve all had problems with the microphones … but now they’ve got problems with their people,” he said. Apple Bondi was contacted but did not respond for comment.